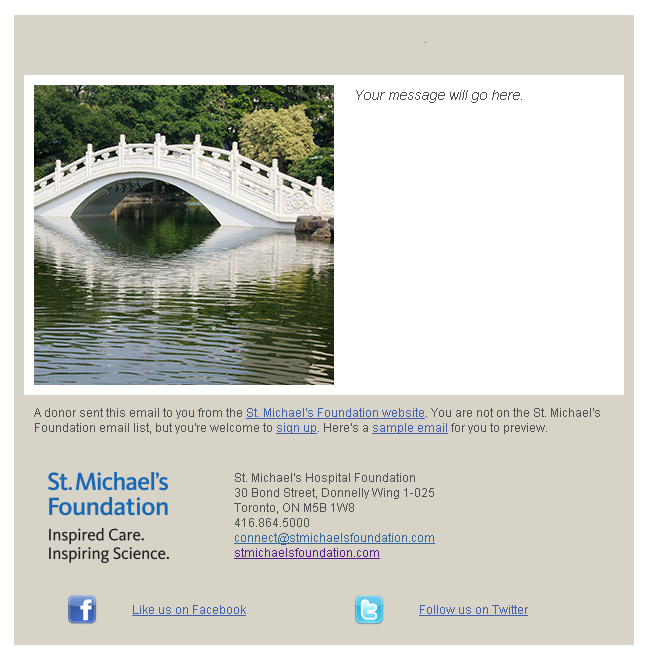 Welcome to the St. Michael’s Fundraising Centre FAQ! Here you’ll find more information about fundraising for St. Michael’s, tips and resources to help you along the way and answers to frequently asked questions. How do I make a donation to someone's fundraising page? Once you find the fundraising page of the person or participant you want to support, you can make a donation online using your credit card or Paypal account. When making donations to support a specific event or participant's campaign, please tell us the name of the event or campaign and the name of the participant you'd like to support. Call us at 416.864.5000 to give using your credit card. Visit us in the Foundation office next to the Hospital to deliver your donation in person. You'll find us in 2 Queen Street East on the 7th floor. 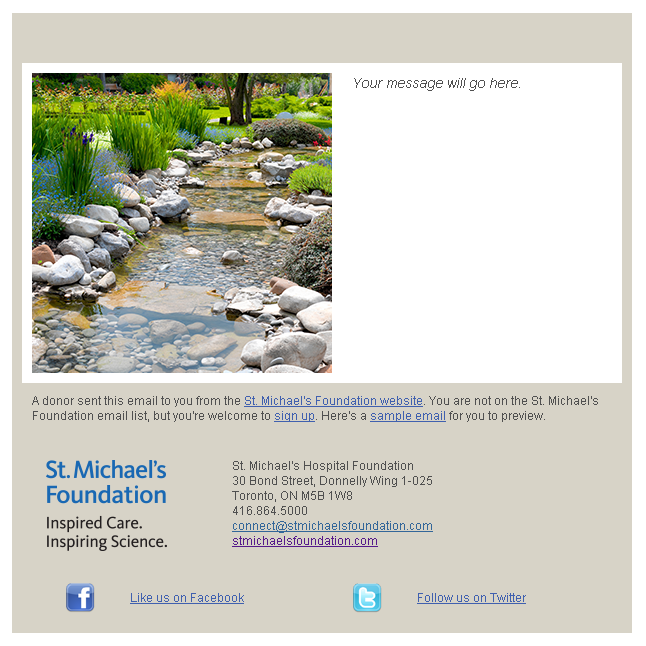 When writing a cheque, please pay to the order of: St. Michael's Hospital Foundation. How do I find a fundraising page? Usually, using the Google-powered site search at the top right of our website is the best way to find a fundraising page. Try entering the name of the person you'd like to support and press 'Search'. If you don't find the fundraising page you're looking for in your results, you can donate on our main donation form and enter the name of the person or campaign you'd like us to put your donation towards in the Comments field. We'll credit your donation to the campaign you specify. St. Michael’s Foundation is a registered charity and provides charitable tax receipts for donations of $20 and more. For online donations, after you make a donation of $20 or more online (in a single donation), you’ll receive a confirmation email from St. Michael’s Foundation. If you don’t see an email from us in your inbox, check your "spam" or bulk mail folder. If you don’t receive the email, please contact us so we can verify your donation was received and provide you with a copy of your tax receipt. For donations you make by phone or by mail, we’ll process your gift and send your tax receipt by email or by post. If you don’t receive your receipt within six weeks of mailing or calling in your donation, please contact us and we’ll arrange to send it again. What is a fundraising page? 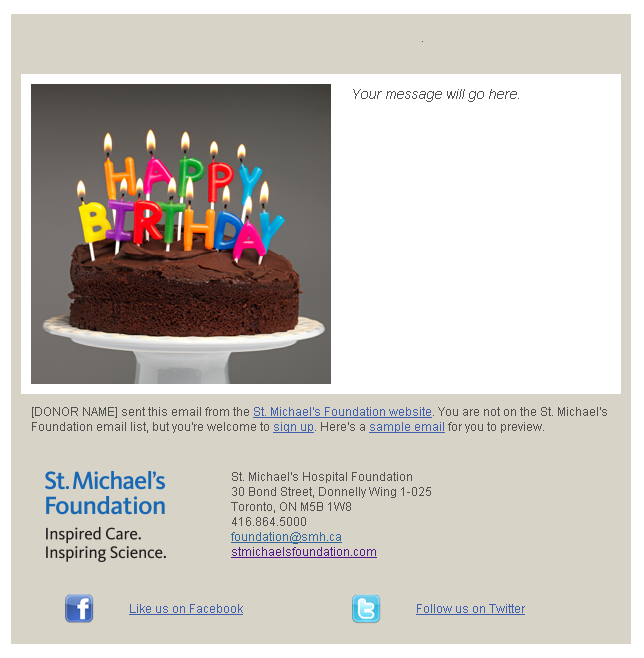 A fundraising page is actually a set of online tools designed to help patients and families raise funds to benefit St. Michael's, in celebration, in memory of a loved one or as a campaign. Why should I create a fundraising page? What do I need to know to create a page? Our fundraising pages and tools make it easy for you to ask people you know to pledge their support to your campaign for St. Michael’s. Creating a page is as easy as filling in a form. If you send emails, you'll find it easy to manage your fundraising page. Celebration fundraising pages honour a person, or couple, and are often related to a special occasion. Set up a ‘Celebrations’ fundraising page to honour a person and invite people to make a donation in the person’s honour. 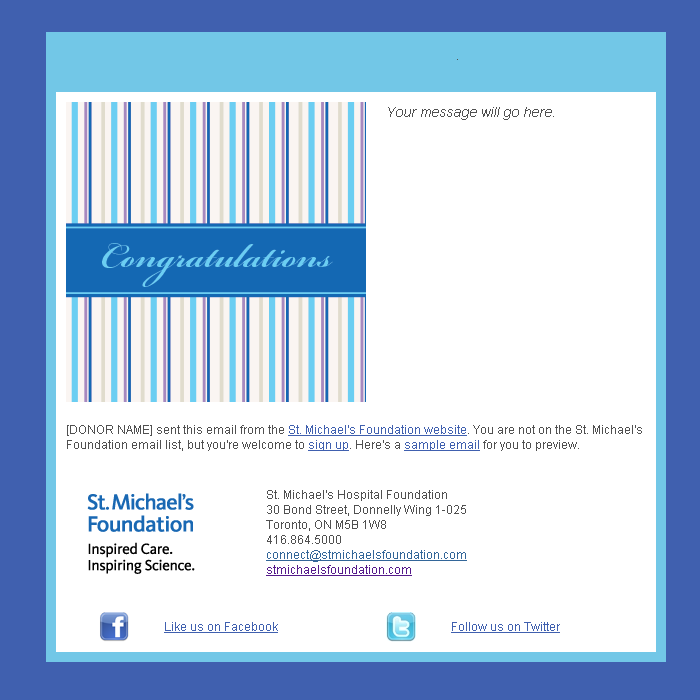 Ecards - When friends and family make donations, they may send an ecard with their message to the person of honour. Memorial fundraising pages honour a person’s life and allow friends and family to donate in memory in lieu of sending flowers. Donors may send an ecard to the next of kin with their condolences. A campaign page is a place to tell the story of why St. Michael’s is important to you and invite friends and family to pledge their support for your personal fundraising campaign. For campaigns, there is no person of honour or next of kin to send acknowledgement ecards to. You can opt-in to receive a notification whenever someone makes a donation on your page when you register for your fundraising page. Plan to host an event for St. Michael’s? Want to lead a team fundraising challenge? When you host an event or organize a team challenge to benefit St. Michael's, you'll receive access to online tools to help you fundraise. To learn more about hosting an event or organizing a team challenge, visit our Volunteer and Team Events section for guidelines and how to send your proposal. Email Message Centre – Use your existing email address, upload your email contacts and save all of your fundraising emails with your page. You can browse current events to see if there’s one you’d like to join. If a ‘Join Team’ link appears on the event page and the team doesn’t require a password to join (closed events are limited to the captain’s family, colleagues or friends), go ahead and register! 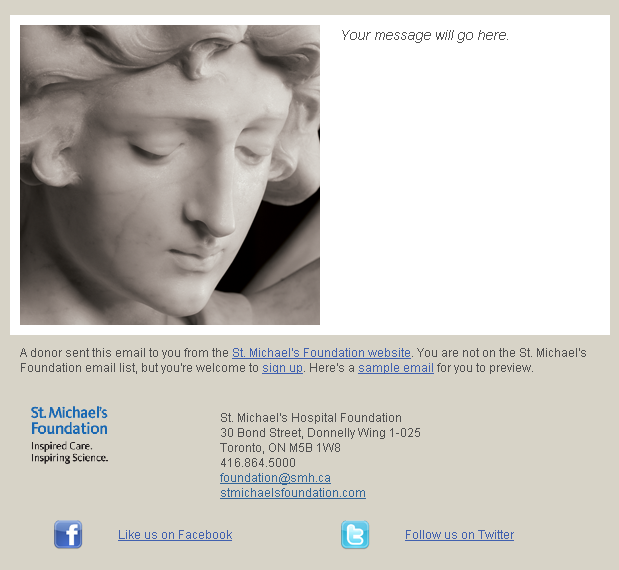 After you register, you’ll receive an email from St. Michael’s Foundation with a link to your page. To host an event or team fundraising challenge, visit our Volunteer and Team Events section for guidelines and to send us your proposal. As you know yourself, as carefully as you plan, unexpected and urgent needs – like needing a tow truck or a set of crutches after a traffic accident – can arise. When you fundraise online, your campaign supports the ‘Area of Greatest Need’ and enables us to respond to unexpected emergencies here at St. Michael’s. Gifts made to support the ‘area of greatest need’ at St. Michael’s give us the ability to respond quickly and efficiently to unexpected challenges. With a safety net of funds from angel donors like you, unanticipated events do not compromise our ability to provide the best possible care for you, our patients. Every day, our doctors, nurses and healthcare teams help our patients through life-changing moments. This is only possible because of the support of friends like you who believe in our mission and provide the funds necessary to help us deliver constant and unparalleled care to patients. Your support helps us respond efficiently to challenges as they occur so we can remain ready to care for you as we have in the past, as we do now, and we will in the future. You know a lot of people – probably more than you think! So reach out to those people – friends, family and colleagues alike – and ask them to help you reach your goal. The Champion Centre makes it easy to email your contacts to tell them about your fundraising page. You can also ask over the phone, in person or using social media sites – whatever works best for you! You can customize the URL for your webpage so friends and family can easily find their way to making a gift. How can I make my fundraising page more personal? Add a personal message: Take a few moments to think about why St. Michael’s is important to you. Ask yourself: Why do I want to help St. Michael’s? Put down your thoughts in your own words. Then, take one of our sample appeals and make it your own. Your friends, colleagues and family will want to help you reach your goal to help St. Michael’s by making a donation. How do I track my progress and stay motivated? Plan! Set a timeline for reaching ¼ of your goal, ½ of your goal and ¾ of your goal. Make your campaign a part of your day: Tell people how your campaign is going when you see them, add updates on your page about your progress. Use you social profiles, too: Update your status on Facebook to let people know what’s going on or tweet thanks to one of your donors on Twitter. Let everyone know your campaign and how close you are to achieving your goal. Don’t be shy about asking people again! You can see in your Champion Centre if your contact has visited your page or not – if they haven’t visited your page, they may have missed your email, or they could have been busy and meant to get back to you. Send a follow-up to remind them. Whenever a donor makes a donation to your campaign online, you'll receive an automatic email notification if you opted in. The next time you login to your Champion Centre, go to your Email tab and click Contacts in the sidebar. When you’ve received a donation from a contact you’ll see an envelope icon with a red arrow. This is a ‘follow-up’ icon to remind you to send a note to say thank you. Click the follow-up icon to send a thank you email to every donor. You can use our ‘Thanks’ template message, an email from your ‘Sent’ list, or type in your own message to let each donor know you appreciate their support. How do I add donations to my page? Once you have these details, log in to your Champion Centre and press the ‘Enter new gift’ button on the right side of the page and enter your donor’s gift. Then, don’t forget to deliver the cash and cheques to the Foundation office. How do I submit cash and/or cheques? First, add your donors and their gifts to your fundraising page. Then, download your donor list from the bottom of the Progress page in your Champion Centre. Highlight the names and gifts you’re submitting along with the cash and cheques, enclose them in an envelope with your name and the name of your campaign and drop them off at the Foundation reception desk in person or mail them to the Foundation. Reception is open weekdays from 8:30-4:30pm to accept gifts for your campaign. St. Michael's Foundation provides tax receipts for each donation of $20 or more. For online donations, charitable tax receipts are sent to the donor by email for each single donation of $20 or more (as a PDF attachment to the message). Can my contacts donate by phone or by mail? Yes. For more information, please see our other ways to give. Ask your donors to tell us your name and the name of your page, campaign or event. We’ll send you an update when we process the gift and then you may add the donation to your page. If one of your donors tells you they made a donation and we haven’t confirmed their donation with you yet, please contact us so we can direct the funds to your campaign when we do receive and process the donation. How long will my page stay online? As a charitable organization, St. Michael's Foundation provides grateful patients and volunteers with online tools for the purpose of fundraising for St. Michael’s. Our resources don't allow us to maintain your content on our website as a service, and we can't guarantee your page will be available forever. For this reason, we suggest you back up all of the content you create and your messages on your personal computer or storage device. 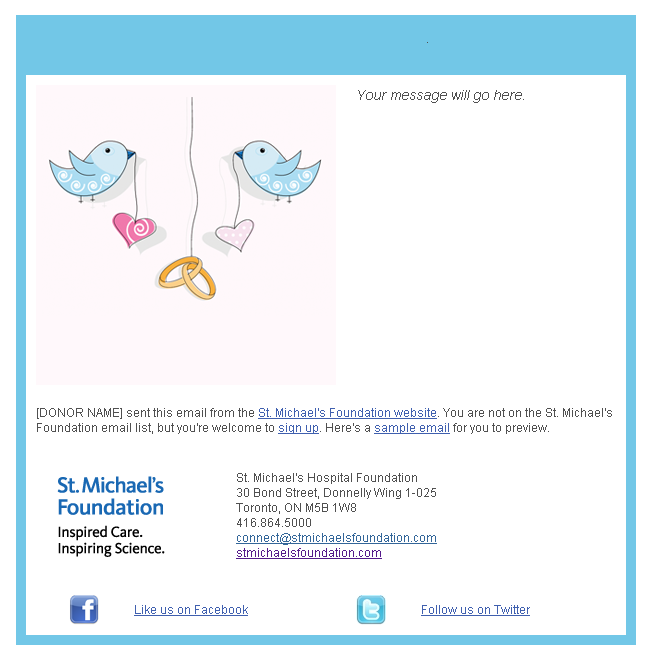 If you can’t find your page, or if you need help accessing your page, please contact us at info@stmichaelsfoundation.com. Am I obligated to make a donation? As a fundraising page creator, you are not obligated to make a donation to your own campaign. But of course, you are welcome to make a donation to your campaign, and many successful volunteers start by making their own gift. Putting your own donation on your page can show the people you appeal to for support that you personally support St. Michael’s. We appreciate all of your efforts to support St. Michael’s and we appreciate all donations, large and small. Can I set up more than one page? Yes, you can set up as many fundraising pages as you like. We recommend you create a separate page for each fundraising celebration, memorial or event you hold. After you’ve set up your first page and uploaded your contacts, when you create a new event or campaign, you’ll be able to access your Contacts list from your previous fundraising pages. Can I offer incentives to people who donate on my page? In order for St. Michael’s to provide a charitable tax receipt for 100% of your donor’s contribution, you can’t offer goods with market value as an advantage to making a donation. If you're running an approved Community Event, you or your sponsor may donate goods to auction at your event and the proceeds of the sale can go to St. Michael’s. Learn more in our Events Guidelines. Can I sell tickets through my fundraising page? You may use your event site to promote your event, and your page can advise visitors how to purchase tickets but you cannot process tickets through your fundraising page as donations. All donations submitted through your webpage must be 100% tax deductible so you can’t offer an event admission, entertainment, food, drink or goods in return for making a donation. You may sell tickets on a website like Eventbrite to go to your personal bank account or credit card, or collect cash and cheques made out to you, and then you could use part of these funds to pay for event expenses and donate the proceeds. Learn more in our Community Events Guidelines. The contacts you upload or enter into the Message Centre will not be added to our mail or email database. The people you add to your Contact List in your Champion Centre are your contacts. They will not be called, or added to our email or mailing list unless they share their contact information with us directly by making a donation. When one of your contacts makes a donation from your page, they give us their contact and payment information in the donation form. We use donor contact information to provide tax receipts. In the donation form, we ask donors if they would like to receive our emails. Donors may opt out of any communications from us at any time by contacting us or in emails by selecting 'unsubscribe' in any email message. When we receive donations to your campaign, we give the donor the option to disclose the amount of their donation and we ask whether or not they would like to display their name on your donation page. If a donor decides not to disclose their information, we respect their privacy. Sometimes, this means we aren’t able to disclose to you which of your contacts made the anonymous donation to your campaign. But, all online gifts towards your campaign will show in your campaign even if the gift does not show up as coming from a specific contact. If you think one someone may have made a donation, we suggest you ask them. Often they will be happy to disclose the details to you privately but wanted to avoid having their name listed online. The dashboard where you manage your page and send out emails to ask people to support your campaign is called your Champion Center. If you created a page on our website, you can access your Champion Centre from almost any page on our website. Click the 'Login' link at the top right corner of your screen. 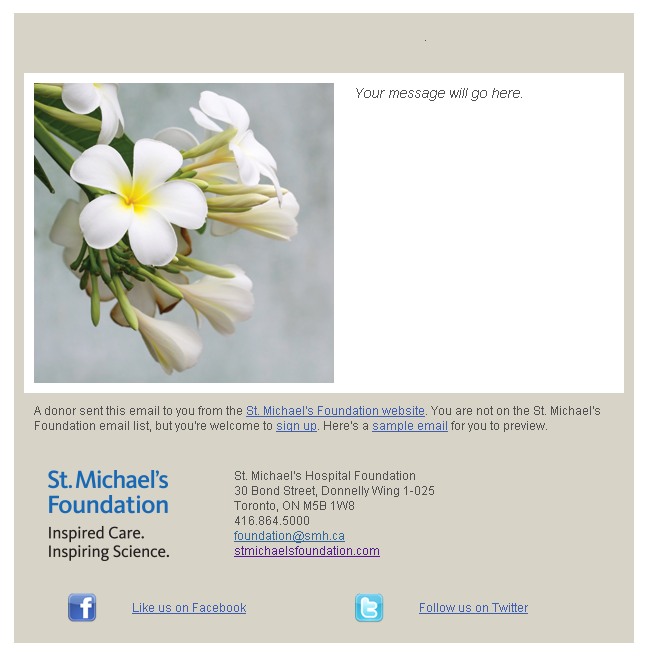 Bookmark stmichaelsfoundation.com in your browser so you can visit us often to updates your page and send thank you notes to your donors! Forgot your username or password? Go to the login page and click 'Trouble Signing In?' link. Click 'Forgot Username' or 'Forgot Password', fill in the form and you'll receive an email from St. Michael's Foundation with a link to reset your password. After you log in to your Champion Centre, you can set a link to your page that’s a bit easier to remember in the Personal page tab. The highlighted section can be your name or the name of your campaign or event. You can use letters and numbers, but don’t include any spaces or special characters. Hint: The ‘smh’ part replaces the ‘www’ on many web pages, so you don’t need to type in ‘www’ in to your address bar to get to your page. If you need help with your page, you can login and click Help to search or browse topics in your fundraising page's extensive Help Guide. This guide will help you manage your page with step-by-step instructions and images of the Champion Centre. What are you trying to do when the site error occurs? If possible, share the link to the page you were on when you experienced the issue. Please describe how the site responds. If there is a specific error message, please note what the error message says in your email.